Some people have zero concept of personal space and get far too close for comfort. Which is why Kathleen McDermott crafted the Personal Space Dress that inflates when it detects a person standing in your zone. The dress features proximity sensors, an old umbrella, and an Arduino controller to sense when a person is near and then actuate the umbrella parts to expand. McDermott’s dress won’t be available for purchase any time soon – the dress is part of her work in the Urban Armor series that explores wearable technology and how women experience public space. But if you’re desperate to get your own, there’s a DIY tutorial so you can build one for yourself. 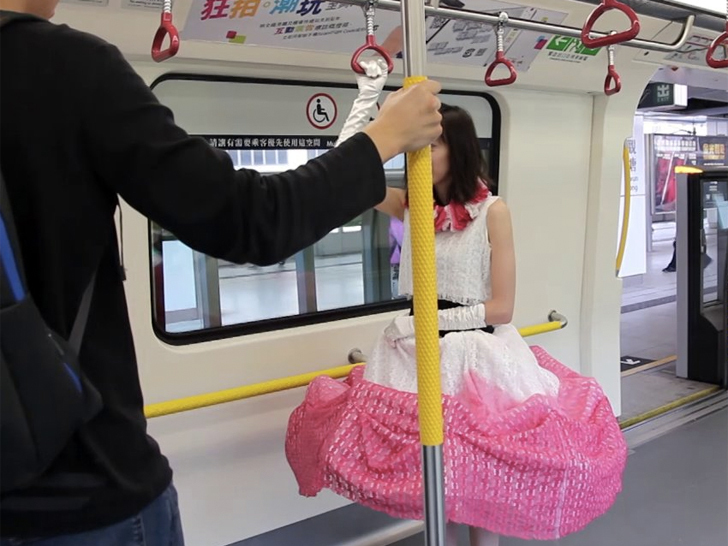 The Personal Space Dress is part 2 of Kathleen McDermott’s Urban Armor series. The art project explores wearable technology, electronics and how women can enhance their public experience. Urban Armor #1: The Auto Filter v1.0 is a scarf that actuates to cover the mouth and nose if it detects unwanted smells. If someone has bad breath or is smoking and breathing right into your face, then the scarf moves up in a blatant display of offense protecting the wearer while alerting the other person of their awful smell. Like the Auto Filter, The Personal Space Dress works to protect the wearer from offense people who maybe get too close. McDermott fashioned a dress with an old umbrella, deodorant can parts, and Arduino controllers. When a person stands too close, the proximity sensors detect them and automatically extends the dress out. The audible sound as well as the expanding dress is enough to make the offender step away. Once the person backs off and the sensor no longer detects a threat, the dress retreats. Part hoop skirt and umbrella, the expandable dress is perhaps not that far off from historic fashions with large cage skirts. Designed purely as an artistic work, McDermott has no intention to produce the dress for sale, but merely wanted to engage in conversation about public space. However, if you really want one, there are DIY tutorial on McDermott’s site, Urban Armor, with detailed instructions on the Arduino programming, how to assemble the skirt with the old umbrella and more. Some people have zero concept of personal space and get far too close for comfort. Which is why Kathleen McDermott crafted the Personal Space Dress that inflates when it detects a person standing in your zone. The dress features proximity sensors, an old umbrella, and an Arduino controller to sense when a person is near and then actuate the umbrella parts to expand. McDermott's dress won't be available for purchase any time soon - the dress is part of her work in the Urban Armor series that explores wearable technology and how women experience public space. But if you're desperate to get your own, there's a DIY tutorial so you can build one for yourself.